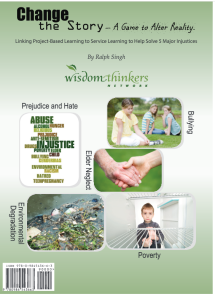 Wisdom Thinkers Network will help coordinate the resources to make it happen – pulling business, Gov’t, and NGO’s together to support our children not only passing the tests of life and succeeding in school, but helping to create solutions to our societal problems. Have you ever felt like you had no control over your life or the world around you? “Change the Story” was created as a learning game allowing students, and adults, to take control of their lives and the world around them and learn character education.